Bolivian President Evo Morales arrives at the Legislative Assembly accompanied by lawmakers, La Paz, Bolivia, Jan. 22, 2019 (AP photo by Juan Karita). 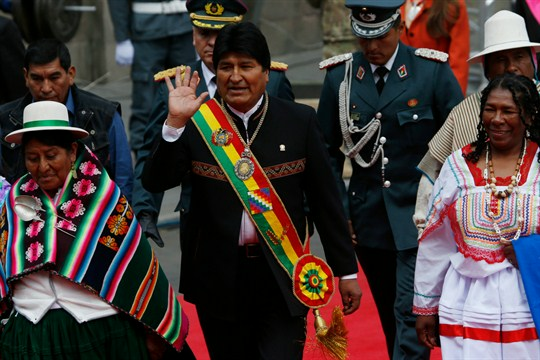 Bolivian President Evo Morales marked the 13th anniversary of his presidency this week as he prepares a controversial run for a fourth consecutive term in office. Bolivia’s top electoral court has upheld his right to run in October, even though Morales is term-limited by the constitution and his attempt to amend the constitution was rejected in a 2016 referendum. In an email interview with WPR, Martín Mendoza-Botelho, a professor of political science, philosophy and geography at Eastern Connecticut State University, discusses the implications of Morales’ attempt to cling to power and explains why he is still favored to win despite the unpopularity of his re-election bid.